This chapter documents a green energy management framework for software development companies. An initial framework has been constructed through analyzing the reports of large scale software development firms. The key components of the framework consist of energy sources and energy efficiency, energy-efficient heating, energy-efficient lighting, and energy-efficient cooling. These themes include a number of sub-themes and criteria therein which are used to build the green energy management framework and then utilized for constructing the research questions for further data collection. The results highlight the most efficient energy sources, efficient heating measures and technologies, efficient lighting measures, and technologies as well as efficient cooling measures and technologies. Implications for practice have been suggested at the end of the chapter. The organisational challenge for ensuring sustainability has been eased by a number of frameworks and concepts which aims to support organisations in their effort to ensure and implement sustainability measures in their decision making. A framework is defined as a set of conceptual elements organised in a way, the reader could get a more structured understanding of the phenomenon. This research systematically reviews the existing literature on business sustainability frameworks. Having incorporated a multiplicity in industry focus in the framework analysis, the literature review is presented in terms of the industries. Content Based Disciplinary Frameworks: Providing specific indicators that characterise single parts (related to specific functions or processes) of the system concern (e.g., supply of quality air function, air flow buffering function). 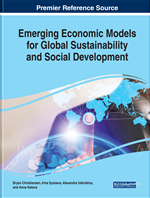 Both these approaches of conceptualisation have been identified as giving a good structure to derive indicators, it is inevitable to review and classify the existing business sustainability frameworks into these two broad themes in order to derive some insights. Whilst, the system based approaches are more conceptual and provides a valid foundation for deriving indicators which could be used for evaluation, it only facilitates the qualitative evaluation parameters. On the contrary, the content based disciplinary frameworks provide a quantitative foundation for evaluation parameters. In addition to these classification approaches, the industry based frameworks have become inevitable to measure the industry relevant sustainability parameters. For an example supply of quality air function, air flow buffering function are two important indices to measure the environmental sustainability of agricultural systems, whilst the transport route and truck loading are specific indicators for the sustainability of manufacturing sector. Therefore, an industry based approach has been adapted for classifying the sustainability frameworks in the course of this research exercise. Arguably, there are documented criticisms with regard to the lack of research in terms of developing frameworks for assessing the economic, social and institutional aspects of sustainability (Labuschagne, Brent, & Van Erck, 2005).